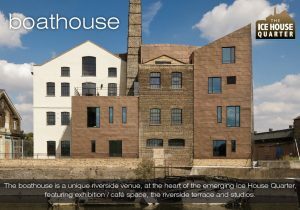 The Boathouse Barking is the venue to book for rehearsals, exhibitions, small-scale performances, community, corporate and family events in East London. Access could not be easier. Overground (Barking) and Underground (East Ham) stations are minutes away on foot. The venue is just off the North Circular, 500 metres from A13 junction. And London City Airport is only 1.5 miles away as the crow flies. Inside the venue, you will find two studios with sprung floors that can be transformed to suit your requirements with the help of the experienced onsite team. Both feel peaceful and private, with the sense that you and your guests have ‘got away from it all’. Feel free to as for a quotes for catering while you are here. For further details, please complete and return the form or call 020 8594 0039 today. Lovely venue, it’s a great size – with parking! I had my baby shower there with around 60-80 guests. Was ideal for me as it was very local. The staff were very helpful and supportive – would recommend and use again. Saturday/Sunday £450.00 per studio. Hire of both studios £675.00. PLEASE NOTE THAT SITE VISITS TO THE STUDIOS ARE BY APPOINTMENT ONLY. PLEASE CONTACT US AND WE WILL BE HAPPY TO ARRANGE A TIME FOR YOUR VISIT. When alcohol is supplied by the host, there may be an additional surcharge for security depending on the nature of the event. This will be discussed at enquiry time. A deposit of £100 is payable for PRIVATE CELEBRATION EVENTS – this will be refunded for studios left as found, when all guests and host have left the building by the contracted finish time of the hire. White Chair Covers including sashes – £1.50 each. Table Cloths £2.00 each. Speaker with wireless microphone £15.00. Please enquire for additional items. Used for a baby shower, venue is nice and big, great parking facilities, really value for money… would highly recommend a viewing. Great spaces and canvas to make any event to your liking. Would definitely use again. We have a small galley kitchen which may be used for setting up but is not suitable for cooking or reheating. Hot lunches are available and we are delighted to provide you with a bespoke catering package on request. The Boathouse studios is an amazing venue for any type of event. With some imagination and creativity it turned out to be the best place to have my son’s first Birthday party. The boathouse is an impeccable and beautiful building space. I loved the quirkiness of the space and the natural artistic feel of the rooms. We actually saw two massive carp fish in the river looking down from the boathouse windows. The customer service we received was first class. Thank you for allowing us to use your space.